The jury in the trial of Network Rail and five executives accused of safety breaches over the Hatfield crash has been sent home for the day. It had earlier retired to consider verdicts in the Old Bailey case which prosecutors allege resulted from a "cavalier approach" to standards. 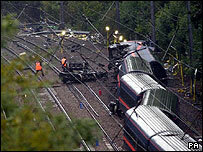 Four people were killed when the King's Cross to Leeds train left the tracks at high speed on 17 October 2000. Defence lawyers said the executives were being used as scapegoats. The trial got under way in January. The court heard the 115 mph crash took place when the train was derailed by a cracked section of the track. The prosecution said a backlog of essential work had been allowed to accumulate, and claimed the rail had been identified for repair 21 months earlier. Balfour Beatty, which had the contract to maintain the track at the time of the accident, has admitted a charge under the Health and Safety Act. But the firm does not accept all the facts of the case the prosecution has outlined against it. Network Rail, formerly Railtrack, which owned the East Coast Mainline at the time of the derailment, has pleaded not guilty. Three Railtrack executives - Alistair Cook, 52, Sean Fugill, 52, and Keith Lea, 55 - and two executives from Balfour Beatty - Anthony Walker, 48, and Nicholas Jeffries, 50, have also denied the charges. "These five men worked in an under-funded, under-invested railway industry, which had been neglected by governments of all parties for over 40 years and which had recently undergone a botched and unworkable privatisation," said Jonathan Goldberg, QC, for Mr Jeffries. During the trial, Balfour Beatty and the five rail executives were formally cleared by the judge, Mr Justice Mackay, of manslaughter.